I am constantly seeking something unusual for my bridal shop. I enjoy bringing something really unique for selling to brides who appreciate beautiful things that I can product without fail over and over again. The first thing that has to be absolute is that the design is well digitized. Seeking them is always a challenge. For one thing, you cannot see how the design is actually created. You can buy one and using the Alphabet Xpress software, you can check it out using the technique shown in The Computerist's Blog - Reverse Engineering a Design. That will show you the digitizing techniques used. 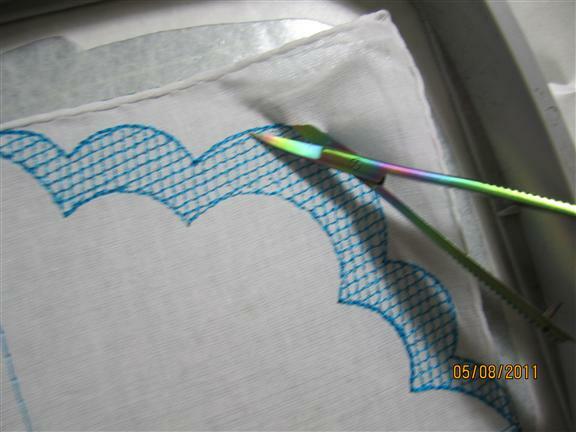 You will, of course do a 'discovery sew' where you will be doing a sample/sew of the design under your circumstances. I did my discovery sew without a single problem on this. I was so delighted with the placement and precise layout. 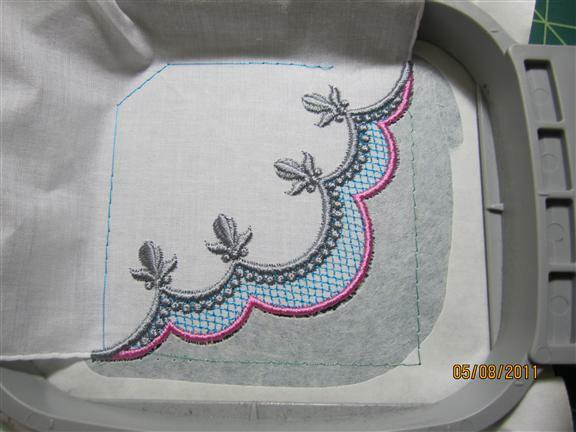 I did my sample on a hankie but it would be excellent for napkins! 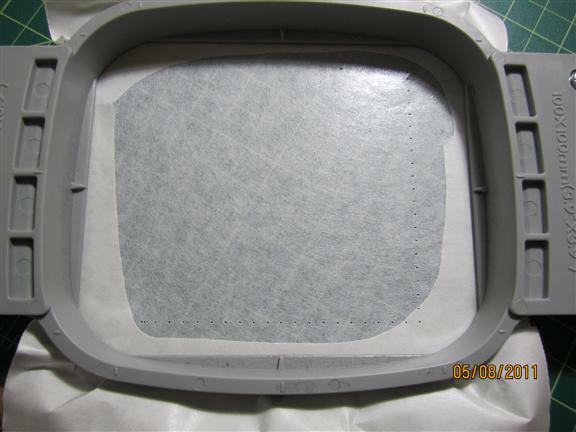 First, the instructions say to start with an adhesive stabilizer ready for the project. I prefer Ann's Water Soluble Adhesive Stabilizer for several reasons. First, it is very reasonably priced, second, it performs two jobs and it has never gummed up my needles. 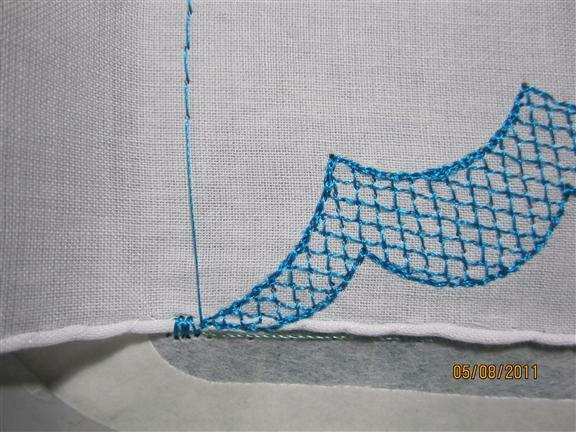 The first line is the placement line, just as you would do if you were doing an applique. 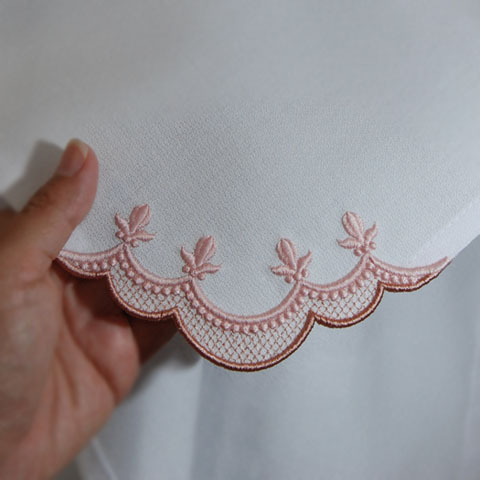 Place the hankie, napkin or other corner object on that line. Sew out the first stitching of the design. I was concerned about the edge being in the right place and this one is right on target. 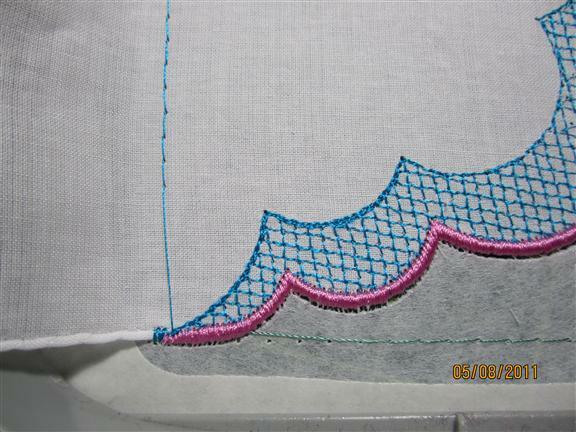 Trim away the fabric as close to the stitching as possible without cutting the stitching. Place the next stitching and again, I am checking the line up of the edging. What a great match! The last selection of stitches is placed. 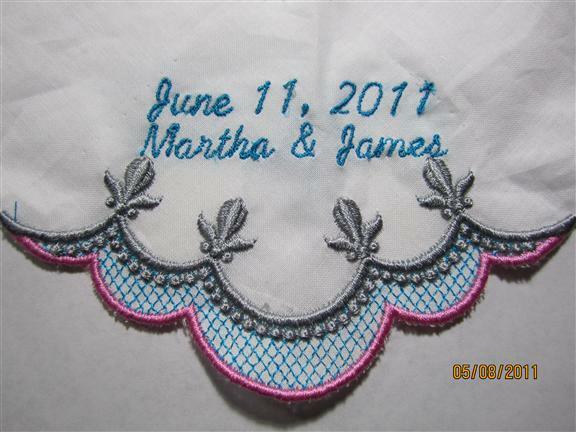 In this case, it included a fleur de lis, satin stitches and some lovely Candlewick style stitching. Here is my sample. I love this design and feel it will be well appreciated by brides everywhere. You make it seem so easy that I will try it. Your designs are beautiful. What talent! I envy it. These are not my designs, I truly wish I had such talent! But I was so delighted with this exact positioning. I seek out the best and most innovative designers to present to you. All my blogs are about my experiences and I truly love doing the blogs. I have even discussed my failures in my blogs. That is what sharing information is all about. Discuss the good, the bad and the ugly to get to the project for which you are the most proud. Thank you for your comments, I appreciate them SO MUCH! I love your idea. Where can I get that design you used? That is the place to get the design. 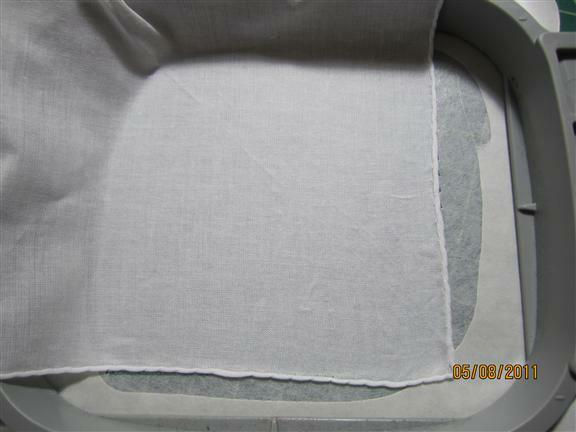 How do you remove the sticky from the back of embroidery, I tried washing and it doesnt' work. Do I have to tear it off bit by bit ? 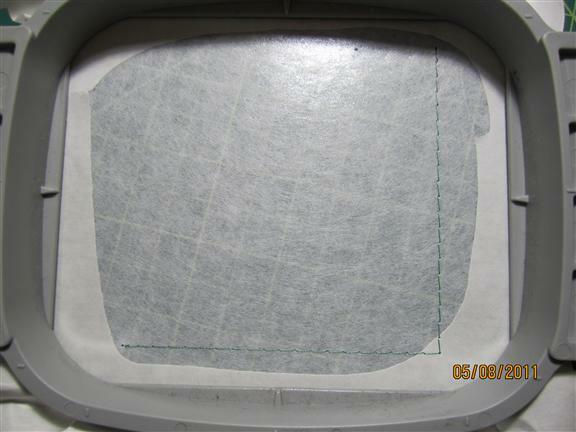 Fabricmaniac - You need to be sure you are using adhesive wash away. I really love the one here at Ann's (link is in the blog). I have used another one without success so I recommend that you find what works for you and keep with it. If you did not have it wash away, it was probably a tear away. If you are sure it was wash away, you may want to consult where you bought it. Thanks for the tip how to nail that corner. Will definitely try it on a hanky. Thanks for all the comments, you cannot know just how much they mean to me! I do want to reiterate that you need to be sure you are using an adhesive wash away. The best of the best is the link in the 4th paragraph above. I had trouble with the other brand I found. Of course, you may not have any problems with your stabilizer. I hope you don't. I know you won't with Ann's Water Soluble Adhesive Stabilizer. These are beautiful. I can see this design on a set of napkins. Use either an initial or some dainty decoration that would go with the persons decor. Wonderful. Thank you very much for sharing this with us. I know that we are all trying our best to have superiour results. 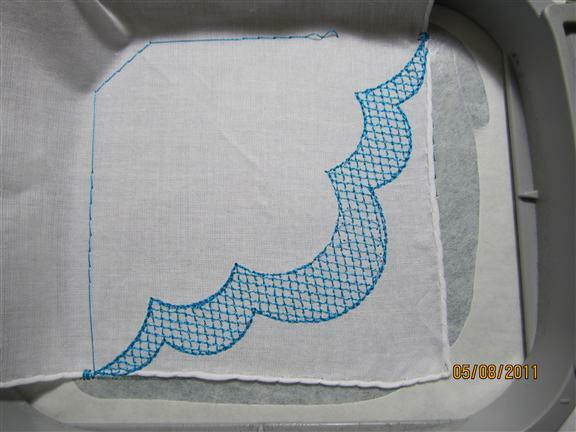 I found that a spray-on glue works very well for me in applique. That might be worth trying. I live in Durban, S.A. and it is very humid as I live on the sea. Maybe you could try this. I hope that it will help. Thankyou to Ann, the Gran, for the lovely designs and tips. I hope you will be very blessed. Love, Susie. Thank you cme and Susiesembroidery! Frankly Susie I have more than my share of blessings and I appreciate each little thing that comes my way. Thanks again to every one of you! I have just recently started doing the machine embroidery and have really been enjoying it, trying new techniques, etc. that will work best for me. I TOTALLY love this design and hope to try my hand at it. Wish me luck !! Thanks for sharing it..
Pat thanks for positing this blog. I get so much from your blogs. Have been wanting to tackle a corner cutout. Now that I am retired, and have just yesterday had gall bladder surgery, I can get busy in my sewing room. Friends - I was just reviewing some of my old Blogs, and this one stands the test of time.